Abstract. Model errors play a significant role in air quality forecasts. Accounting for them in the data assimilation (DA) procedures is decisive to obtain improved forecasts. We address this issue using a reduced-order coupled chemistry–meteorology model based on quasi-geostrophic dynamics and a detailed tropospheric chemistry mechanism, which we name QG-Chem. This model has been coupled to the software library for the data assimilation Object Oriented Prediction System (OOPS) and used to assess the potential of the 4DEnVar algorithm for air quality analyses and forecasts. The assets of 4DEnVar include the possibility to deal with multivariate aspects of atmospheric chemistry and to account for model errors of a generic type. 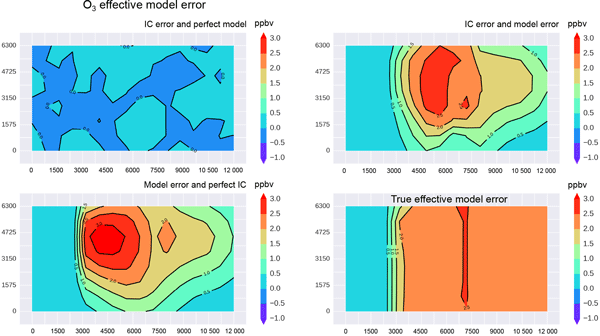 A simple diagnostic procedure for detecting model errors is proposed, based on the 4DEnVar analysis and one additional model forecast. A large number of idealized data assimilation experiments are shown for several chemical species of relevance for air quality forecasts (O3, NOx, CO and CO2) with very different atmospheric lifetimes and chemical couplings. Experiments are done both under a perfect model hypothesis and including model error through perturbation of surface chemical emissions. Some key elements of the 4DEnVar algorithm such as the ensemble size and localization are also discussed. 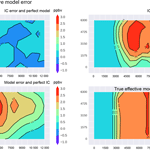 A comparison with results of 3D-Var, widely used in operational centers, shows that, for some species, analysis and next-day forecast errors can be halved when model error is taken into account. This result was obtained using a small ensemble size, which remains affordable for most operational centers. We conclude that 4DEnVar has a promising potential for operational air quality models. We finally highlight areas that deserve further research for applying 4DEnVar to large-scale chemistry models, i.e., localization techniques, propagation of analysis covariance between DA cycles and treatment for chemical nonlinearities. QG-Chem can provide a useful tool in this regard. How to cite: Emili, E., Gürol, S., and Cariolle, D.: Accounting for model error in air quality forecasts: an application of 4DEnVar to the assimilation of atmospheric composition using QG-Chem 1.0, Geosci. Model Dev., 9, 3933-3959, https://doi.org/10.5194/gmd-9-3933-2016, 2016. This paper analyses methods to assimilate chemical measurements in air quality models. We developed a reduced-order atmospheric chemistry model, which was used to compare results from different assimilation algorithms. Using an ensemble variational method (4DEnVar), we exploited the dynamical information provided by hourly measurements of chemical concentrations to diagnose model biases and improve next-day forecasts for several species of interest for air quality.